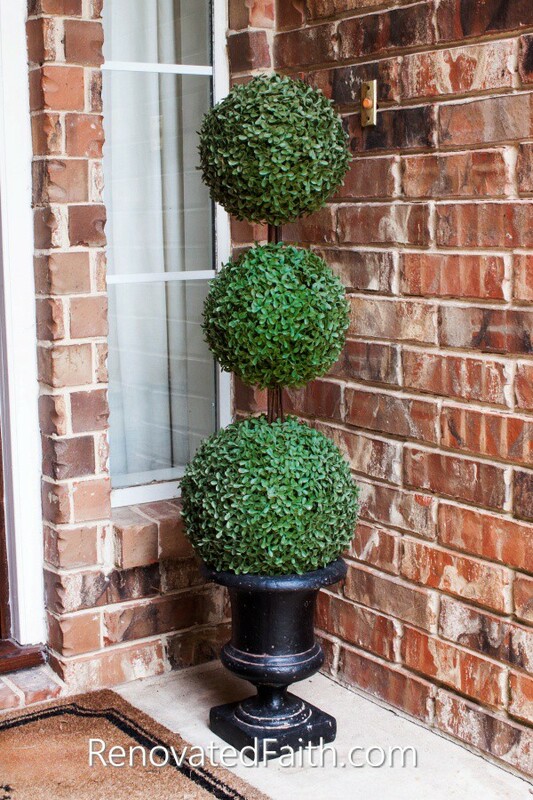 Our boxwood topiary trees were the perfect addition to our front porch because they are versatile for any season. 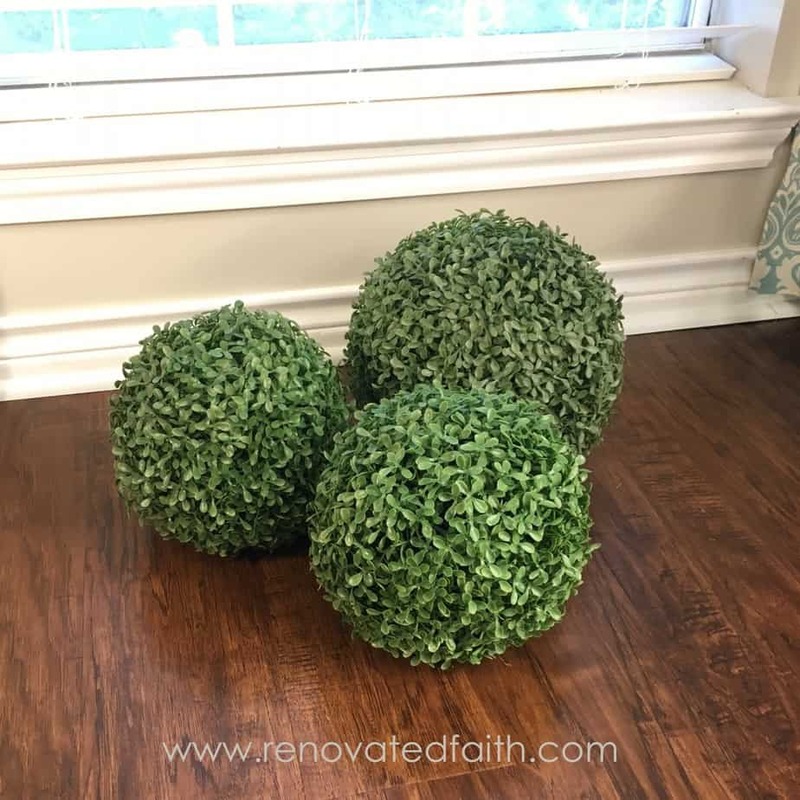 Similar boxwood topiary trees sell online for a small fortune, but I learned how to make my own faux boxwood topiaries that are more durable, just as life-like and a fraction of the cost. 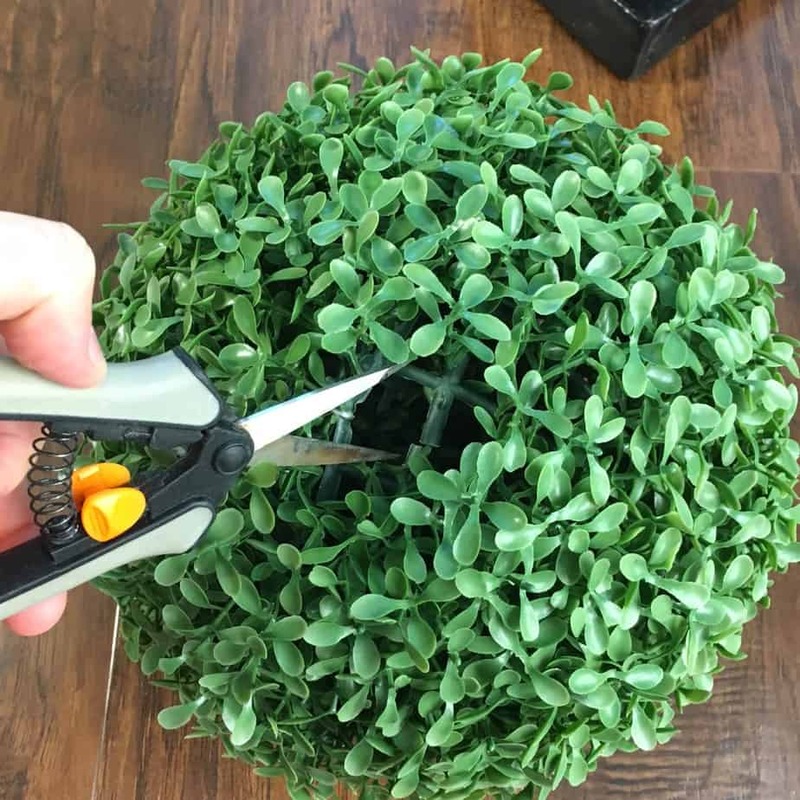 If you like the look of DIY Outdoor Topiary Trees without the high price tag, here I show you how to make topiary trees out of boxwood balls. What is it about spring that makes everything seem right in the world? Dull hues of winter are quickly replaced by bright blooms and new green growth. No matter the length of my to-do list, this season always gives me a sense of refreshment and renewal. Whether it is the sight of beautiful flowers, the sound of baby birds or the cool breeze, I have decided that spring is without a doubt my favorite season. I love to reflect this season in our home to bring inside the same fresh feeling of newness and restoration. 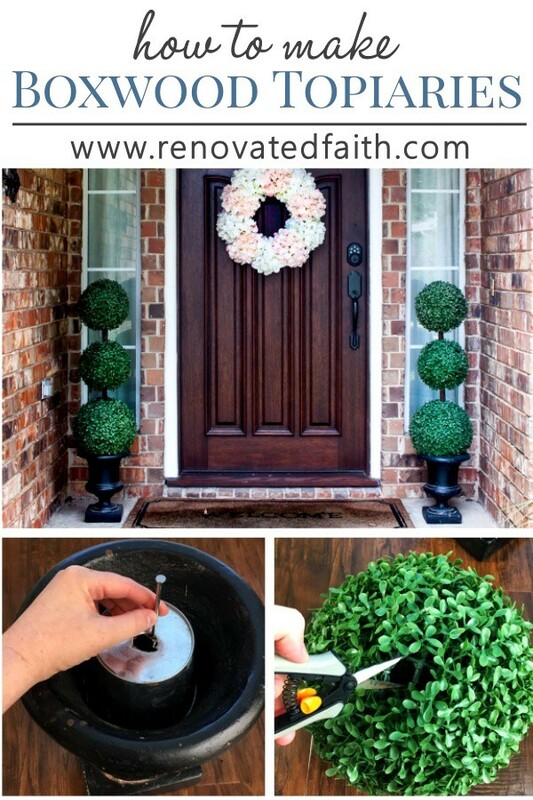 One of my favorite ways to decorate for Spring is with boxwood balls and topiaries. As you can tell from my Boxwood Decor Pinterest board, boxwood is one of my favorites. 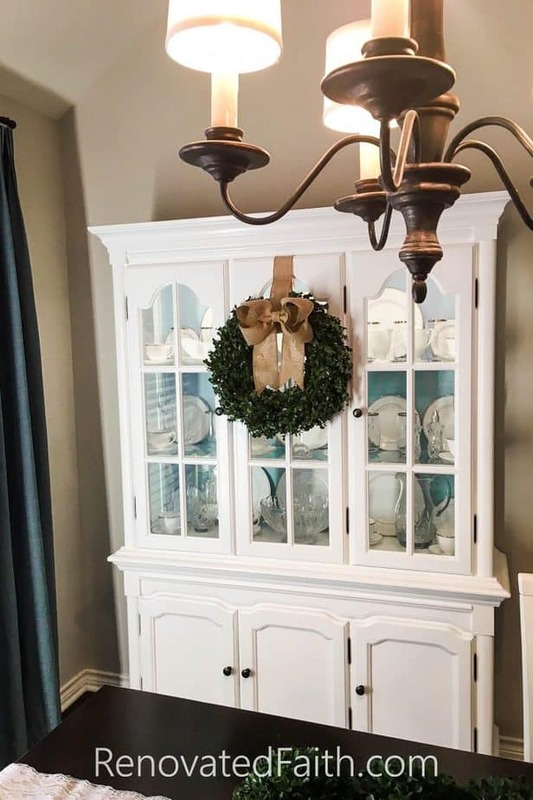 The bright green gives such a crisp contrast against spring flowers and even Christmas decor. Boxwood is perfect to use throughout the year as they complement every season’s décor. 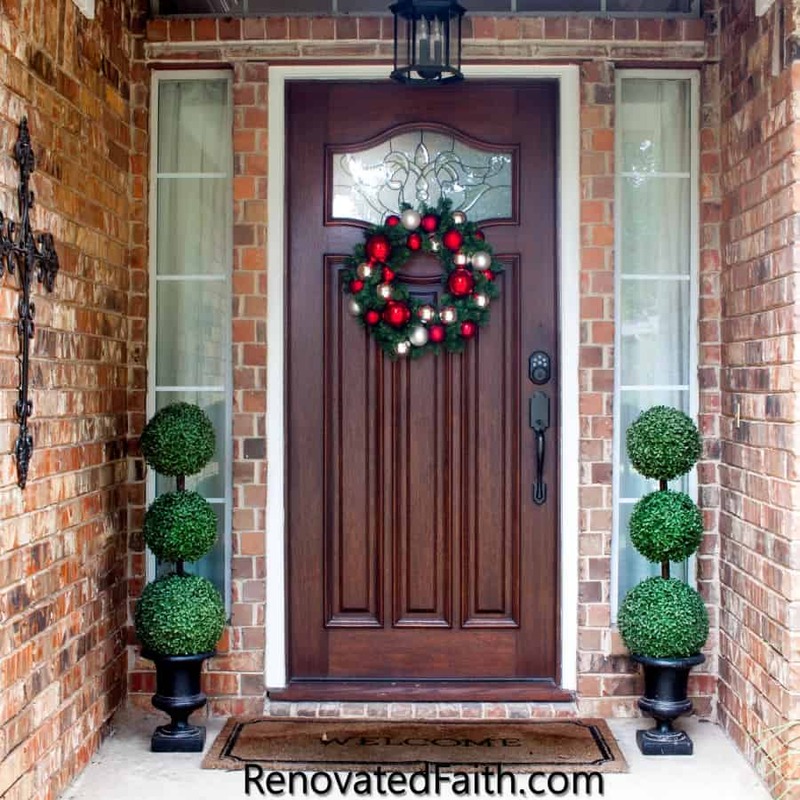 But my favorite boxwood décor would have to be the two DIY topiary trees on my front porch that I included in my post 8 Easy Steps to Affordable Curb Appeal. 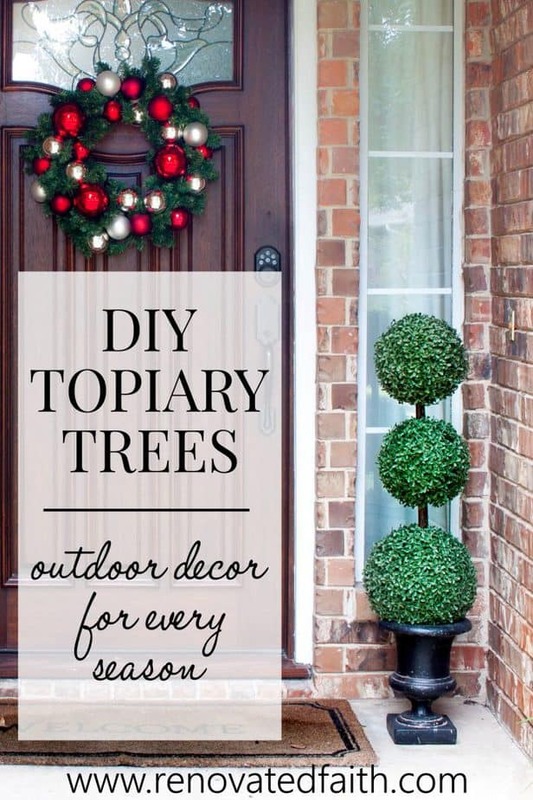 These topiaries were such an easy DIY project and they make such an inviting statement without looking artificial. I made them at a fraction of the cost of those sold in stores and was able to make them exactly the size I wanted. 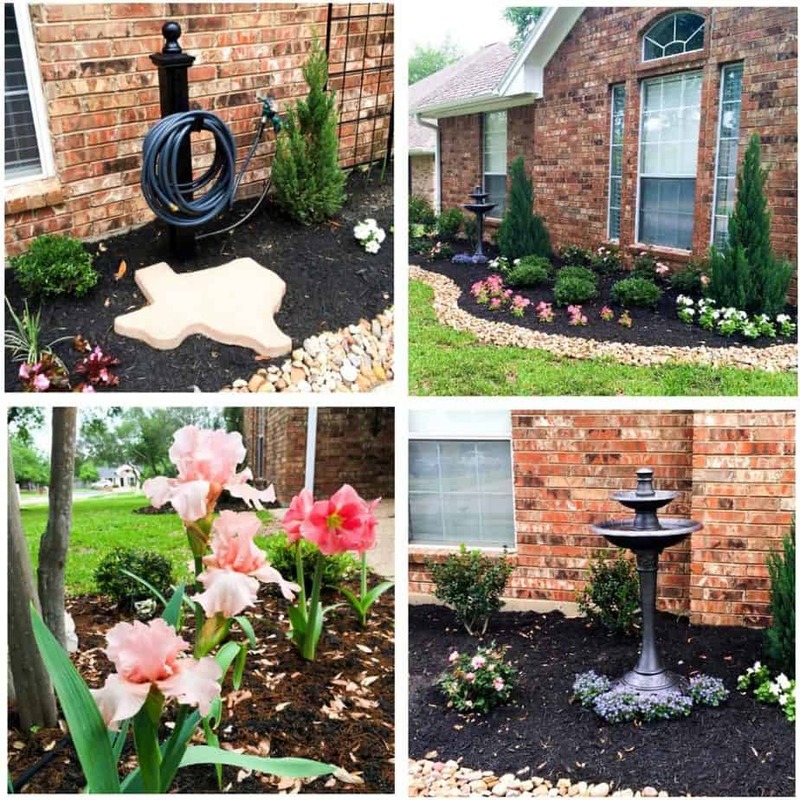 I have gotten many compliments on these topiaries and they have held up well over the past two years, even in the hot Texas sun. Long Branches – I got mine from my backyard. Brown Floral Wire – like this. Stain – I used a sample sized can of Behr’s semi-transparent deck stain Sable from Home Depot. Decorative Pot or Urn – similar to this one. 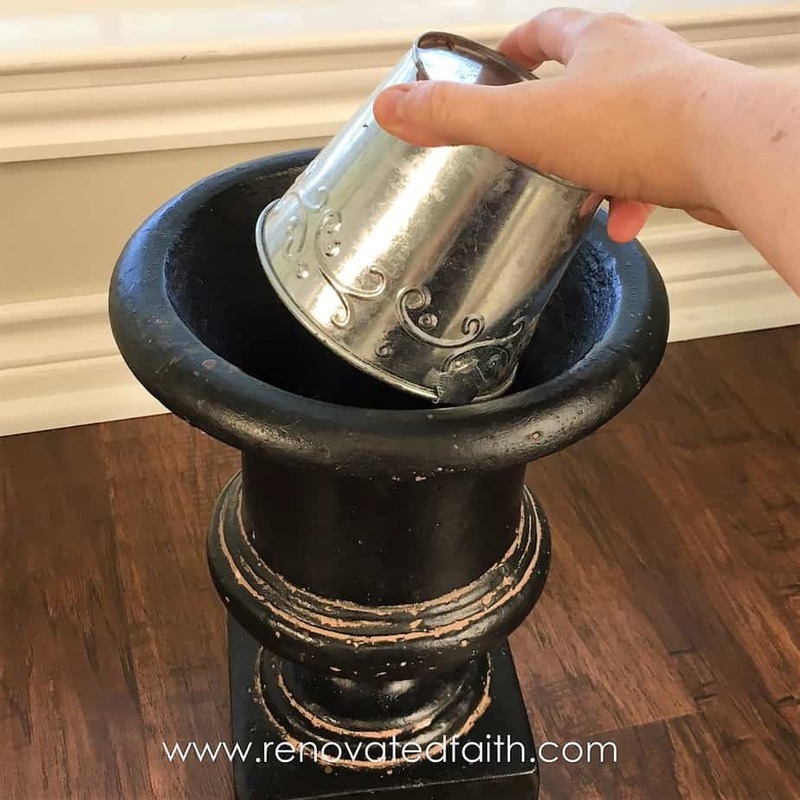 Metal Craft Bucket – Small enough to fit in the pot/urn upside down. I got mine at Hobby Lobby. Find the right size boxwood balls. 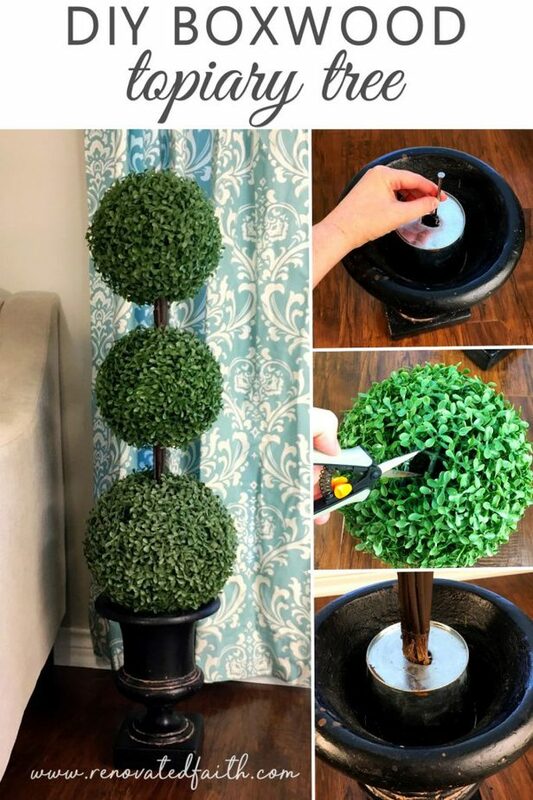 I used one 11″ and two 9″ but the beauty of this project is that you can make your topiary tree as large or small as you want. The dried boxwood is very expensive and not the best option for outside – it also smells funny! You can find several faux options online that look very realistic. Pick out a decorative pot or urn. Ideally, you will want one that is heavy so that it is not easily blown over. However, plastic urns are cheaper but you can always put a little sand in the bottom to make it heavier. Find some very long straight branches and a ¾” dowel rod. Boxwood topiary trees don’t have one long trunk but several smaller stems together. Combined together, the dowel rod and sticksl look just like a real boxwood stem. If you can’t find branches, you can also use ¼ inch dowel rods at found at Home Depot. I used branch trimmers to cut the larger dowel rod to about 48 inches. You can cut your branches about 8 inches shorter than the dowel rod. You don’t want the branches to extend down into the metal pot, just the main dowel rod. I then fastened several branches to the dowel rod with brown floral wire to make a large “stem”. This is way more realistic looking than using one big dowel rod. I tied wire around the stem branches underneath where each ball would go so the wire won’t be visible when it is all together. The picture below is a side-view of the stained stem. 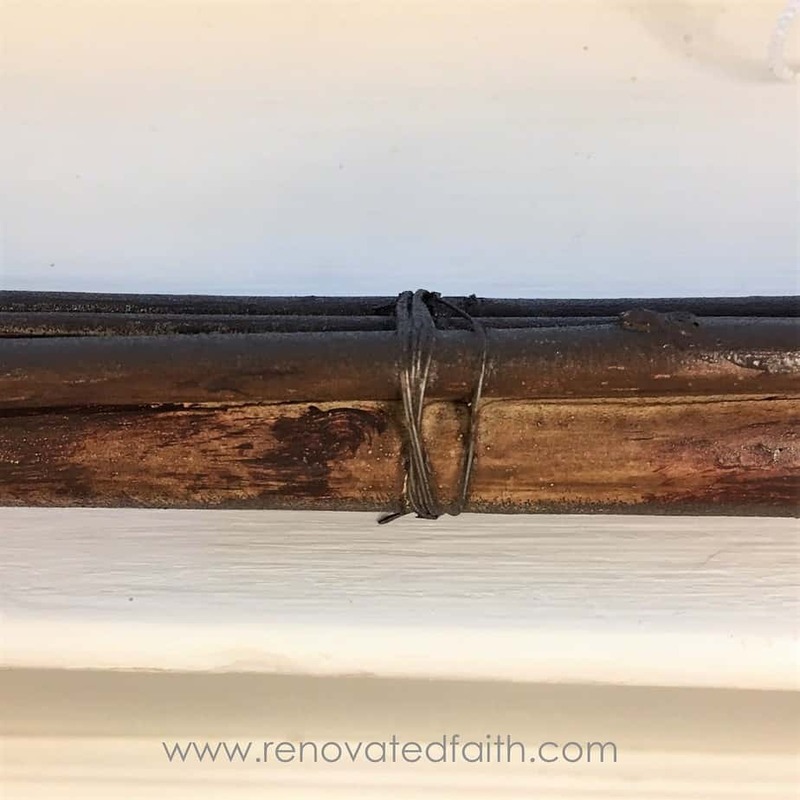 Once you have your dowel rods or branches tied together, it is now time to stain. I used a sample can of Behr Semi-Transparent Deck Stain for about $3. You could really use any stain or gel stain. Ideally, you want to paint the stain on and let it be kind of streaky. I let that dry for a couple of days. In the meantime, take your aluminum bucket and put it upside down in your decorative pot. 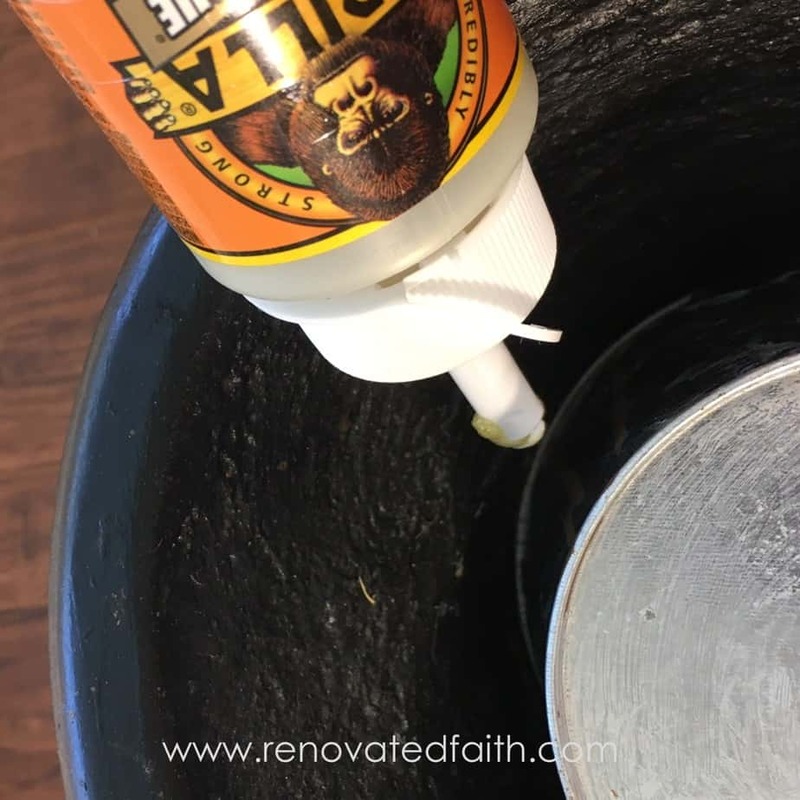 Use gorilla glue to glue the edges in the pot and let it dry 24 hours. The glue will expand around the edges of the pot and that’s normal. You won’t be able to see that anyway. After the stain has dried, it’s time to make a hole for the trunk of the topiary. I used a large nail and hammer and kept hammering holes until I had one big hole just the size of the set of sticks. You want it to be a tight fit so the stem/trunk stays straight. 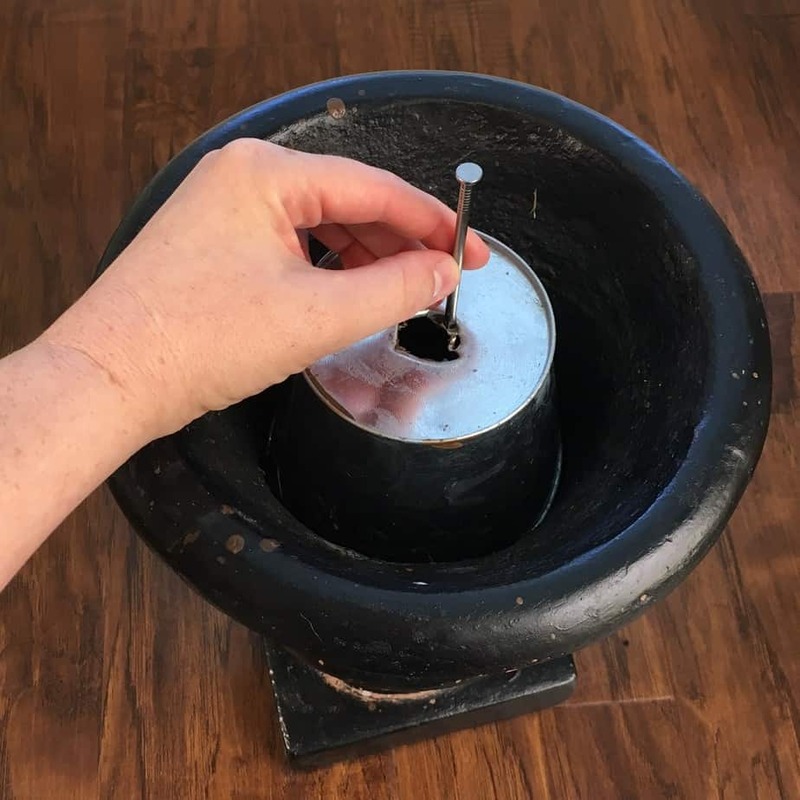 When the hole is the right size, squeeze some gorilla glue into the hole so it goes to the bottom of your pot or urn. Stick in the trunk and make sure it is straight. Let that dry 24 hours. The gorilla glue expands and will hold everything in place. Just stick the rest of the boxwood balls on your topiary trees and you are done!!! Like I mentioned, boxwood topiaries are great to have around the house because they work for all seasons. I love that they are the one decoration in the house I never have to change out. This Christmas I plan on adding some little LED lights to mine! Spring reminds me of new life but also consistency. God tells us in Revelation 21:5 that He will make all things new one day. Until then, we have spring’s reminder of the renewal and restoration that comes from only Him. As God’s all about making things new, He offers us rejuvenation from life’s hardships and worries today. Just as God cares for the birds of the air and the flowers of the field, He personally cares about your every care and concern. 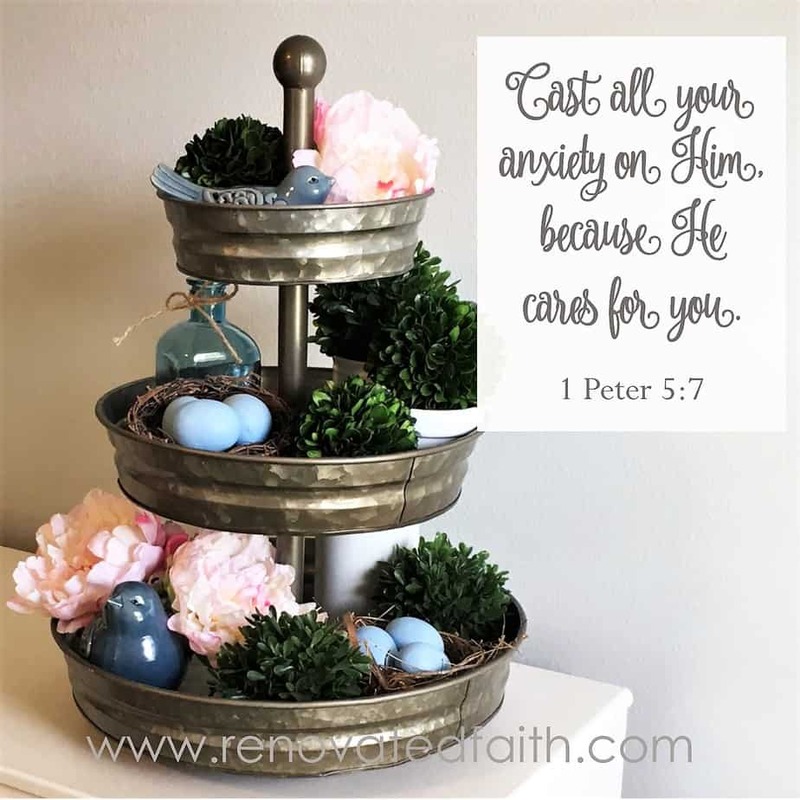 RENOVATED THINKING: “Cast all your anxiety on Him, for He cares for you.” – 1 Peter 5:7 Although seasons of life change and our lives never seem to calm down, His love never changes. He is our true constant, the one thing we can cling to as a calm in the midst of a storm. Just as spring comes every year so do consistently have his peace and comfort. What do you feel is weighing you down? Where are you in need of renewal and a fresh start? Know that He cares for you more than you can possibly fathom and He waits for you to bear all your worries and fears. 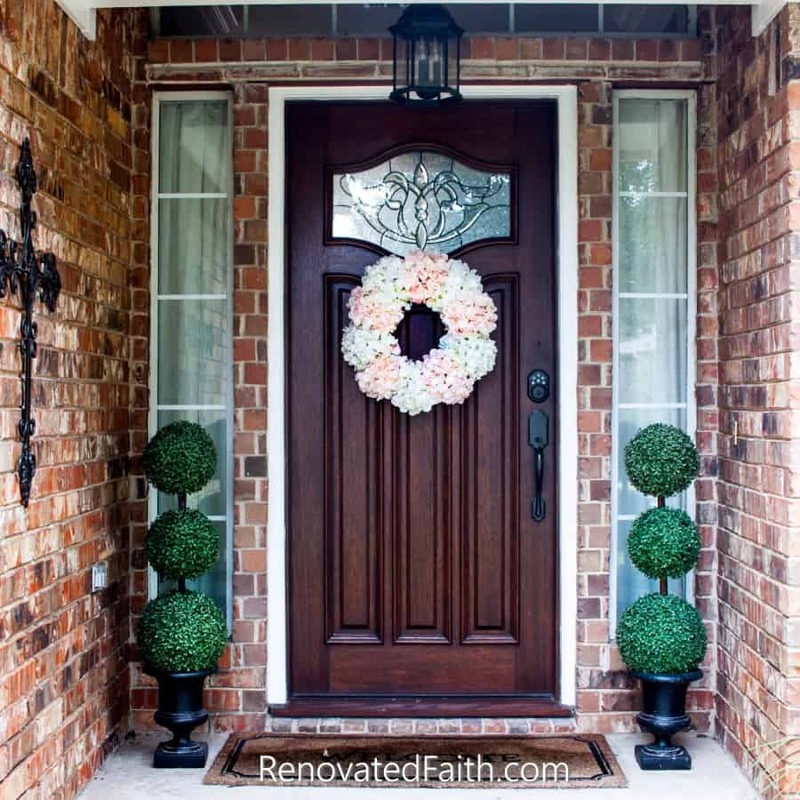 Want do see more outdoor decor ideas from Renovated Faith? CLICK HERE. You might also like my DIY Windmill Wall Decor here. 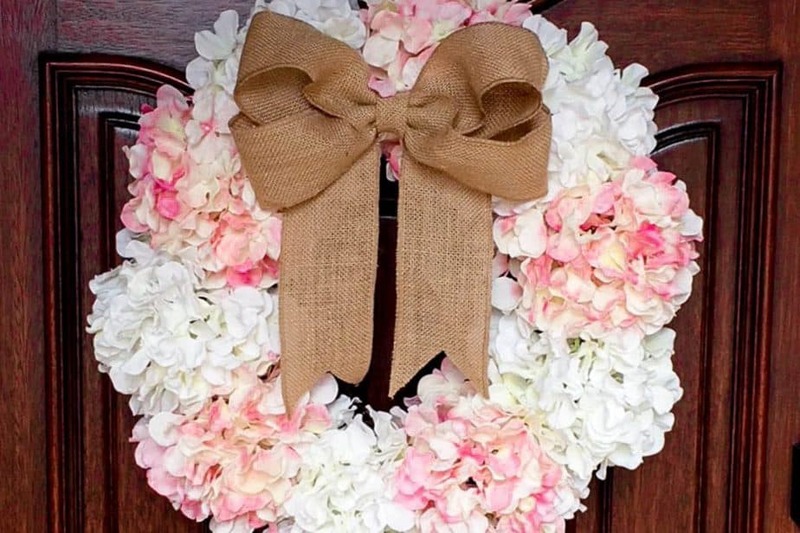 DIY Hydrangea Wreath – CLICK HERE FOR TUTORIAL! Very cute. Its also nice that you dont have to water them. Isn’t that the truth!?! Thanks Mihaela! I just want you to know how BLESSED I am to read your blog and learn new things ! God has truly blessed you with talent and insight !! I can feel your relationship is sweet with6our wonderful Saviour ! It makes it even more meaningful to me because I went to High School with your father-in-law, Jerry and of course your Uncle Terry in Dallas….your great Aunt Bev Schrag-Robinson was ahead of me. Derrill has been a dear friend of ours for 40+ years……it’s a small world, eh?? Say Hi to your Dad for me….he would remember me as Dolly Classen back then ? Hi Dolly! I can’t thank you enough for your words of encouragement! It IS such a small world! I am so thankful for your prayers. My heartbeat for this blog is that women will be drawn to a fun project and come away with encouragement in their walk with the Lord. Again, I’m really humbled and encouraged by your sweet words and they came at a time I really needed them. Can’t thank you enough Dolly! How can I pray for you? Thank you Misty! I love boxwood too as you can tell. I’m excited about the giveaway myself! I got three of the tiered trays on clearance – I’m not really sure why. So, I thought a giveaway would be a fun way to share the other two I am not using! Thanks again Misty!!! Hey Misty! I loved seeing your visit to Magnolia! I’m realizing the key to visiting Magnolia is not to go on a weekend. I love your front porch and your blog is gorgeous. Keep up the good work! Karin!!! I love your site, and of course I love this project! This looks so simple, right up my lane. Making my own at a lower cost, rather than buying is ALWAYS my preference. Your encouragement along with your DIY is brilliant! I just love it all! I can’t thank you enough for your kind words Jen! 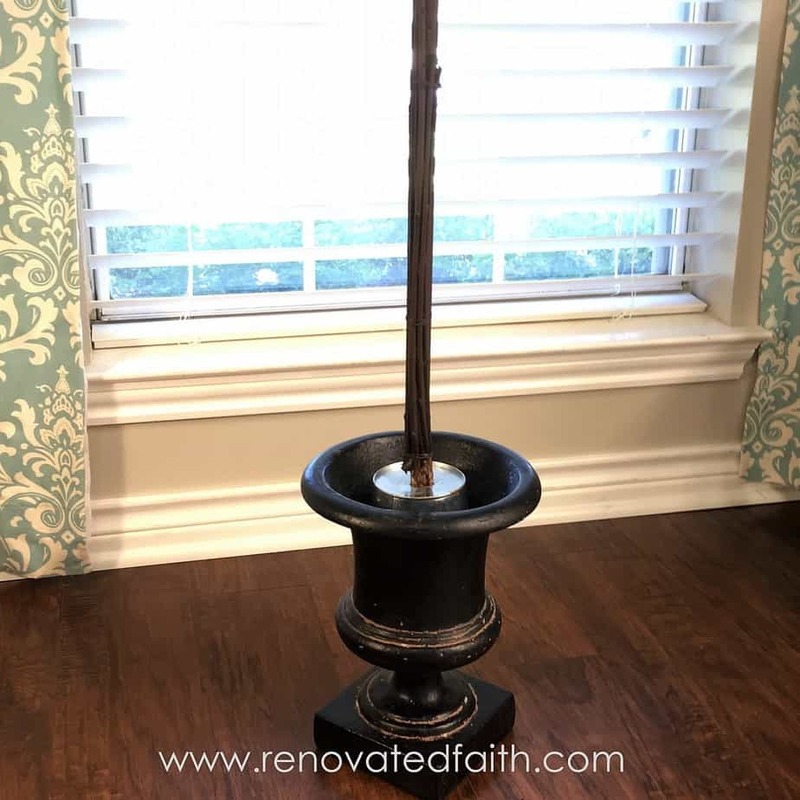 I have so much fun figuring out how to make my own low-cost version of home decor items – maybe a little too much fun! 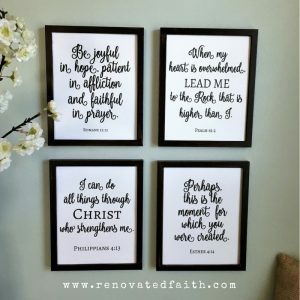 My mission for the blog is that someone is drawn to the blog by a fun project but hopefully goes away with some encouragement in their relationship with the Lord! Thank you again! Hey there! Do you happen to have a tutorial for the wreath on your front door with this picture? Love it! I don’t but I should! All I did was take an 18″ grapevine wreath and hot glue Hydrangea flowers to it. I got them at Michaels and cut the stems to a few inches with a wire cutter. Thanks for stopping by and let me know if you have any questions! Hi ! loved your tutorial I’m definitely going to make this! I’m having some trouble picking out the right size for the pot and I was wondering how many inches is the one that you used for yours?? Karin, This is my 1st time commenting on a tutorial from pinterest,however with that being said Your gift of craftiness,and easy to follow description of your creations is like I said “A GIFT! ” I need some professional craftiness input! I have a 5 ft 4 in. 3 ball boxwood on my front porch next to my door. The birds have plucked her bald! Not a leaf,or stem left! The balls are made of looks like small twigs in a round shape. There’s no styrofoam. How do I fix my tree?! LOL!